Wow! Hasn’t the weather been ridiculously hot this past few weeks. If it has NOT been hot at your place, I want to know where you live stat! And be advised… I am coming over! Seriously, for most of Australia the weather has been extreme to say the least and I bet for those who have air conditioning, it would have been getting a workout! It’s extreme weather, both hot and cold that can really highlight just how effective your home is when it comes to keeping itself cool or warming itself up. This is called passive design and in the simplest terms, it’s your homes ability to maintain a comfortable temperature throughout the year without the need for extra heating or cooling. Extreme weather, just like what we are experiencing right now, can highlight how effective passive design is in your home… if at all. One of the biggest contributors to passive design is the orientation of you home. Which direct you face the most important rooms in your house, such as your living areas, will make a big difference to the temperature inside. The better the orientation the less energy your home will use, or rather, the less extra energy your home will need to keep a comfortable temperature. 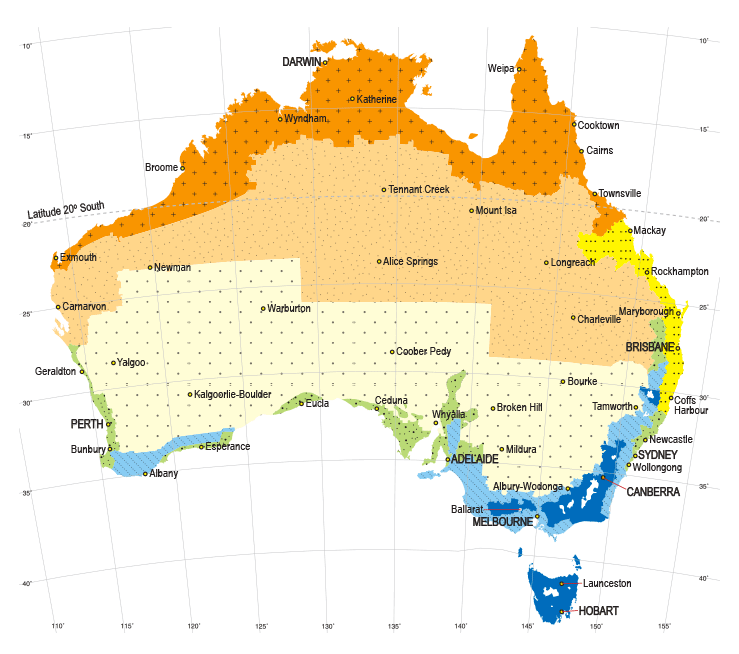 When considering the orientation of you home, you first need know which climate zone you live in (in Australia there are eight climate zones), and know the sun pattern. Once you have worked this out you can evaluate the best orientation for your home. Generally speaking, if you live in the cooler Southern parts of Australia, you want to position your home to maximise the sunlight. While in the Northern parts of Australia where it can be a lot hotter, you want to consider ways you can reduce the radiant heat from the sun. Let’s not forget that the sun sits much higher in the summer than it does in the winter so taking this into consideration when you design your home, especially the use of strategically placed windows and overhangs, will ensure you have both warmth coming through in winter and adequate shading in summer. All the elements that make up your home play a different part when it comes to passive solar heating and cooling. For example, a block or brick home will hold the heat from the sun longer than weatherboard. And windows are great for allowing the sun to shine through, but are not good at keeping the heat in. Air getting into your home or escaping, whether it be hot or cold air can play a huge part in the need for extra cooling or heating. If you went around and sealed up any leaks that allowed air to escape, it could result in a noticeable saving on your cooling and heating bills. Simple things like adding block out curtains that cover the window completely or adding drafts stoppers to the bottom of every door can make a huge difference. Sealing your home for leaks is one of the easiest ways you can help with the energy efficiency of you home. Insulation is also another easy and quick fix that you can do to increase your homes energy efficiency. There are numerous types of insulation that have a vary degree of benefits and downfalls, along with a vary price tags. Of course, it is best to add insulation while you are building your home so you can add it to the external walls as well as in your roof cavity, but there are benefits to be gained from just adding it to your roof cavity at a later date as well. When it comes to insulation, you need to consider all your options and choose the best for your home. But whatever you choose, make sure it’s installed correctly as it’s not just the choice of insulation you use but also how effectively it is installed that makes a difference. How you shade (or not shade) your home will go a long way to increasing the energy efficiency. Adding overhangs on your roof in a hotter climates will make a huge difference. Along with planting shading trees in strategic positions to help shade your home from the harsh sun without blocking the air flow. Often home owners will overlook shading options in favour of maintaining the aesthetic look of the home. You need to decide what is best for you, but there are numerous shading options that not only work effectively but also add to the aesthetics of the home. A well designed home should include passive design elements that enhance the structures beauty. Air flow plays important part to passive design. Anyone who lives in a colder climate will appreciate how the air flow in your home will spread the warmth of a fireplace or combustion stove in winter without the need to add extra heating to other rooms. On the other hand, who doesn’t love a cool breeze dancing through your home to cool you down after a hot day. This is known as cross ventilation and designing your home to allow for cross ventilation will go a long way in cooling your home naturally. As you know, hot air rises, so something you could consider adding to your home is air vents in your roof. Just like insulation, there are several options here, such as grills installed in your eaves or mechanical fans (whirly birds) added to the peaks of you roof. Consider all your options and decide on the best solution for you and your home. Ideally, passive design should be incorporated into you home when it is first built, however this is not to say that you can not take steps to introduce passive design into an existing home. Even just implementing some of the ideas and steps outlined above can make a significant difference to the passive design of your home and in turn, the savings from your cooling and heating bills. If you want to incorporate passive design measures into your existing home but not quite sure what options would be best for you… seek out a building designer or an energy efficiency expert to give you tailored and targeted advice.